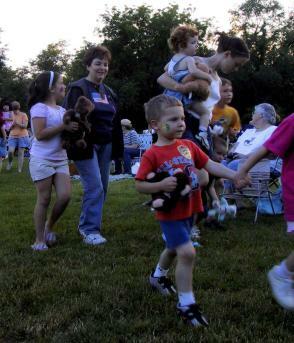 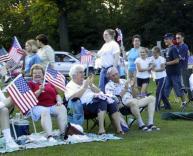 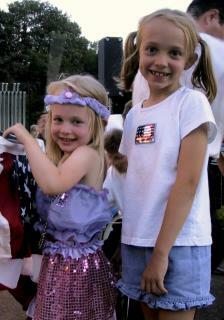 Our 2004 season began on June 6 with the annual Teddy Bear's Picnic concert. 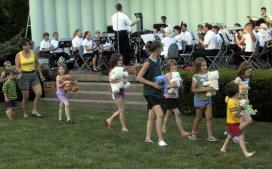 As always, the highlight of the concert was the Teddy Bear Parade, this year led by long-time band member Marcia Korb. 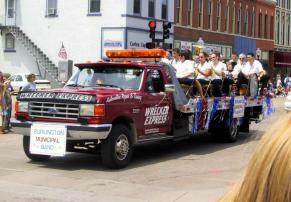 For the Steamboat Days Parade, our band rides on the back of the "Wrecker Express" truck. 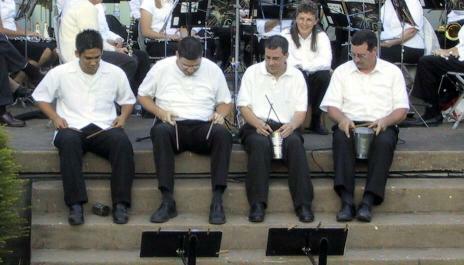 Here are a few photos from our concert of June 20, 2004, conducted by Marcia Korb and featuring "William Tell's Canned Overture for Quartet of Tin Cans played with Spoons," by Michael J. Rhodes. 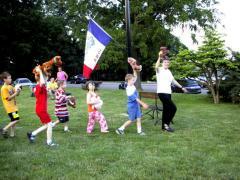 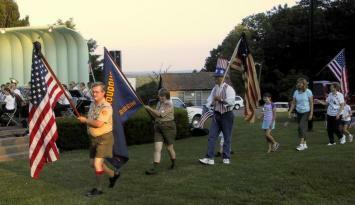 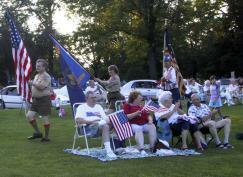 Our July 4 concert appropriately featured a "flag parade." 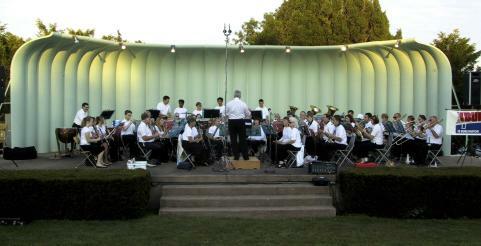 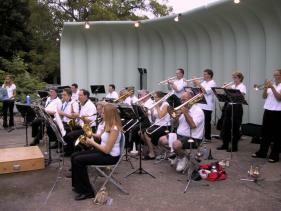 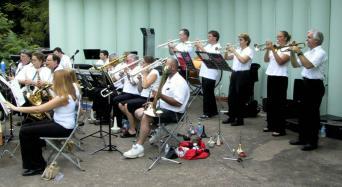 The band played its July 25th 2004 concert under the baton of Mark Eveleth. 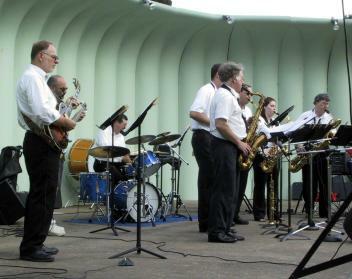 Our August 1 concert was immediately preceded by the performance of a jazz band made up of members of our regular Municipal Band. 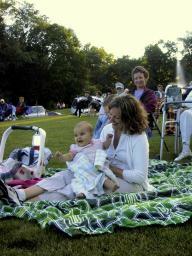 Webmaster's note: Originally, the entire Burlington Municipal Band web site was a sub-site of a larger City of Burlington "Quality of Life" web site. 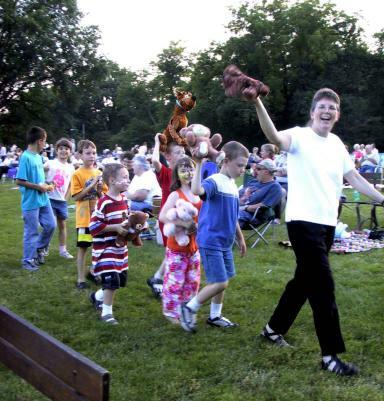 Our pages still sport some of the original layout, with repeated references to "Quality of Life" and links back to the Burlington, Iowa, "Quality of Life" page. 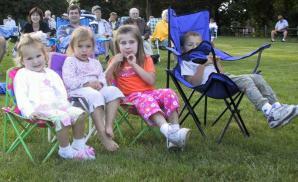 Ironically, as our web site has grown, the city-sponsored "Quality of Life" page has been discontinued. 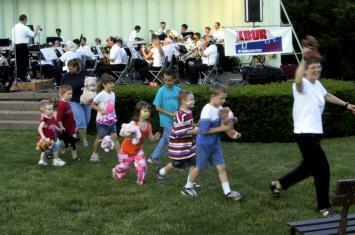 Our August 8 concert was preceded by the annual "pre-concert" appearance by the group "ClasSax." 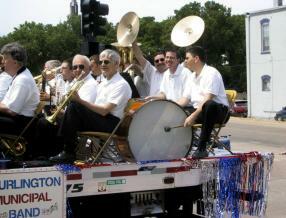 This leaves us in an awkward position, since many of us in the band are quite keen on our contribution to the "Quality of Life" here in Burlington, Iowa. 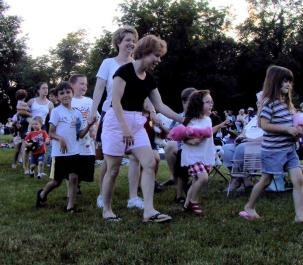 For the moment, I offer up this page of photos from our 2004 season as representative of Burlington's "Quality of Life."